Karen is an independent contemporary-art and media-art director and curator, with 15 years experience of working in the UK and internationally with creative venues and initiatives, galleries, arts organisations and academic institutions, festivals and commissioning bodies, across the mediums of art, science, technology and innovation. Until recently, she was also Head of Innovation at the Crafts Council, UK, running a programme she established for the organisation to profile and support cross-platform innovation across the areas of visual arts, science, medicine, technology, architecture, and design. Prior to this she was Head of Exhibitions for the Crafts Council, UK. She was previously external examiner at the University of Plymouth, UK in 3D Design, and external examiner for Liverpool John Moores University, UK, Digital Media International Programme, Malaysia, 2012-2015. 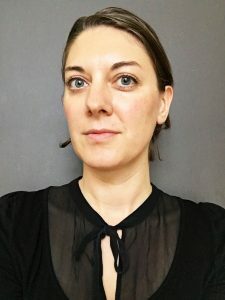 Previously she has held academic posts at Sheffield Hallam University, UK, as a Senior Lecturer and Researcher in Photography and Curatorial Studies, and at the University of Huddersfield, UK, as a Lecturer in Fine Art Media. She was the founder, co-director and curator of Interval from 2005-2009, an arts organisation based in Manchester, UK, which provided a critical forum and exhibition platform for emergent to mid career artists working with technology.